I’ve been in shedding, recreation, and refining mode here the last couple of weeks, which has included getting together donations, organizing, throwing things away, and finding more things than I could have imagined ready to move on. Before I put things up for sale on ebay, I prefer to make things available to others who have deeper connection with them and so I am sharing for anyone interested that I have so far 11 crystal pendants and necklaces that I’ll be selling that range from $45 – $395. I may have more, but for now these include sweet, sacred, ancient symbolism, whimsical, more refined, quite substantial (not for the faint at heart), power and statement pieces, but all potent and each a custom, unique piece. I find myself not wearing any of these for some time now and so for me there is no reason to hold on to something that can benefit someone else. I don’t like holding on to things simply out of attachment or nostalgic reasons, nor thinking I may some day feel to wear or use it again and have it stored away not being able to give of the energy it was intended as. I’m not going to photograph and share each, as I prefer to connect one-on-one with serious inquiries. The prices reflect their original value and if interested the purchases will be through Paypal with shipping added. I can provide instructions if it comes to that. So if any of the stones and crystals below speak to you, and any of the essence descriptions above are your resonance, please message me with your interest and I’ll share more, including photos at that time. A few are malas and others have Faery or mermaid/cetacean essence, there’s Incan, Egyptian, and more symbolism. Stones/crystals include stand alone and combos of: amethyst, garnet, aquamarine, serpentine, peridot, rainbow moonstone, quartz, Rudraksha seeds, larimar, moonstone, seraphinite, carnelian, rainbow fluorite, citrine, turquoise, coral, yellow spondylus shell (shell of prosperity in Peru)…. along with other beads, unusual characteristics, charms and/or sacred symbolism. Today two interesting posts popped up that I feel guided to combine some pieces of the shares and my comments on, in case anyone has interest in “some” of my perspective or feels similar and unsure of themselves, their own choices’ value, or feel alone out there in the Middle and Void. I’ll begin with an interesting observation that I’ve linked in direct manifestation to things, which I’ve been seeing since yesterday morning. We live way high up at the top of the mountain and so the perspective here offers amazing reflections. I shared on Facebook yesterday and this morning about a very interesting veil of clouds that has been here since yesterday morning and feels symbolically reflective for sure. I shared about it along with photos of the clouds and the volcanic sunset before they arrived, and the surreal almost neon sky here last evening. Interestingly Laura posted a blog article today mentioning “looking beyond the veil” and about taking “conscious empowered action” toward the world you want to create. My comment there not only addresses the current scene people are focused on right now, but truly is intended as a bigger picture life perspective of working with opposites, triggers, and creating the new, as I never just focus on one detail taking place, but a bigger picture symbolism for things playing out. And earlier this morning I received notification that someone liked a comment of mine synchronously “out of the blue” from an old post of Laura’s from 2014 titled Integration Lifetimes and the Splitting of the Worlds – one of my favorites of hers and SO reflective and synchronous with all of this. Not only does it describe how we all have different paths and focuses in this life, but shares how each way we are called to “rise to action” will also be different. Not to mention the subject matter of separation and integration being so timely for now as well. “Healing for those on an Integration Lifetime is not so much about removal, as it is about conscious Creation. Sometimes Creation involves a carving away — like sculpting — but that carving away does not become an end in itself. Rather, the carving away exists as a step, perhaps many, many steps, in service to a greater vision, inspiration and spontaneous engagement with the material. Carving reveals Shadows, as greater depth encourages the play of light and dark, but the whole of Creation eventually reveals itself as far more than the sum of its individual cuts. An artist adds something with each taking away, infusing the Creation with life force energy until that Creation can hold its own. I believe the third option of which Inelia speaks has begun to hint at its arrival, because enough people on Integration Lifetimes have come far enough on their individual journeys to open space for something beyond the Void. Old tugs to the familiar remain, but continued Shadow Work coupled with active, conscious Creation in both the imagination and in tangible ways — will continue to gestate this new option until the birthing time. Different people engage Shadows in different ways. My dear friend and sweet faery twin, Tania Marie prefers not to work as an activist exposing wrongs or fighting for rights, but she’s got a body full of extremely potent, powerful, deliberate, beautiful and what some people have even called “scary” tattoos. She’s got a dragon, snakes, and jaguars, occult symbols, Moon goddesses, and ancient languages all in black, black, black ink all over her body. That’s a lot of intensity, money and pain, which she wears in indelible ink as an unapologetic reclamation of the power, Shadow projections, and often corrupted goodness attached to all these things. Embodying the Shadow literally on her body allows Tania to live her life with innocence and childlike wonder while still honoring the vastness and power of her being. Her book, Spiritual Skin, helps others to explore a similar path. Tattoos are widely popular right now, but not for everyone. Some people invoke and integrate their Shadows by embracing whatever taboos have most defined their lives. Others move through various Archetypes and roles. Others attract life threatening illness or injury, which makes them reconcile with their own mortality. Since we all die at some point, this last version of Shadow Work opens itself to everyone — even those not on a full Integration Lifetime. Inelia has noted that “Gaia (Earth/Terra) has actively been pushing for a physical separation that is done through time, three generations, and is trauma free and gentle.” Those on Integration Lifetimes tend to feel deeply connected to Terra and tend to be the ones walking a fine line with awareness of this unsustainable civilization and way of life crumbling to its core (scary Shadow stuff!) and the joy, freedom and excitement of creating and welcoming the new. As more and more Integration Lifetime folks move through their own process of dis-integration and learning to accept the Void, the human frequency on this planet continues to rise and offer encouragement for entirely new ways of being. We can reclaim the best of the old and the new, while consciously finding ways to integrate the pain, darkness and fear boiling to the surface of collective consensus reality. Energy adepts know that energy is energy, so we can mitigate the need for drastic physical events like pandemics and devastating tsunamis by exploring their energy signatures and finding different ways to rearrange and morph the energy. Kind of like radical feng shui! Those who’ve already journeyed through the Void might find their skills and experiences increasingly welcomed as we redecorate and remodel reality, as the awakening masses begin to ask, “OK, we see it, but what the heck are we supposed to do with all this stuff??? ?” The splitting of the worlds option gets rid of it, along with a whole lot of the material world. The integration option might involve some decluttering, but it doesn’t necessarily mean gutting. Think “re-purposing” or making art from junk, beauty from the discordant, healing from pain. The collective has not decided on a path yet, but individuals will each make their own choice. Collective consensus reality just means the tipping point of people with relatively aligned choices. If you suspect you’re on an Integration Lifetime and have been hammering the “positive” button, I’d simply encourage you to use this time delay to make sure you won’t be bored with your selection. Red pill, blue pill. Why take any pill? Or maybe you want a purple one. Maybe you want a world beyond pills. Timely then and timely now….and that Void she speaks of is right in front of me as I share this, with this huge cloud veil still covering the entire lower Tahoe basin area from where I sit. “I know this is so true for me, as I have no desire to, or can’t engage in, many of the things that I see others around me getting so much out of in their own lives. I know that it is perfect for them, but it doesn’t feel aligned with or right for me and leaves me hugely unsatisfied and gaining nothing from it. That’s why people are surprised to learn that I don’t engage in certain things they would “think” I should be, based on ideas of what people have about a certain way of being. I’ve carved out a way and things that work for me and I’m not afraid to be different since I know its for the highest good to follow my intuition. For anyone who thinks that my choice of action is an easy out, cowardly, etc…..I thank you for your opinion and don’t wish upon you to go through what I do and have, but as with anything, until we’ve walked in someone’s footsteps and tried on their “skin” for a while, these remain as one perspective judgment, rather than truth. I share this post because I receive A LOT of messages all the time from people/clients/friends wanting advice, are confused, feeling helpless, invalidated, doubting themselves, and wondering about how I handle things, how I address people if they ask me questions (which never happens except rarely with family and those closest to me), what I’m doing in my own life to work with the energies, and simply wanting to understand something that, for empaths especially, can be all too distressing and in some cases debilitating to feel in the middle. You are not alone. You matter. Your choices are valuable and needed. Trust what’s in your heart. Your position and consistent action in your life of embodying it, IS creating change. So much rapid change taking effect in very literal ways for everyone and I’ve found it to be directly tied to greater embodiment of one’s own essence and authenticity, which then emanates clearly through. It’s connected to the messages we’re receiving about stepping up, raising our vibrations, and living out loud with greater courage and integrity to our nature of origins. And when we do, everything shifts in direct reflection to that in our environment, interactions, experiences, realities, and even how we start to look physically in correlation to our energetic frequency glowing from the inside out. And the more we embrace who we are and aren’t afraid to put it out there, the more others feel greater ease and comfort in doing the same too. I’ve written before on how my lifestyle and life path changes have changed so much for me as a result of embracing deeper integration of my uniqueness and what feels most authentic to myself, along with making balance and harmony a foremost focus and experience. And while we speak often about the emotional, mental, and spiritual ways this happens and takes effect, we often overlook the physical because there’s an undercurrent of negativity placed there or invalidation of it because that’s thought to NOT be part of “ascension” ideas and living a spiritual life. Time and again I’ll reiterate that it’s about integration….physical and spiritual together in harmony and each reflecting the other. “The very reason each exists is to integrate wholeness and realize the partnership they share, one channeled through the other. I’ve always been quite literal in making outer transformations or taking actions that match my shifts internally or the shifts I desire to make, so as to create a space for me to grow into. Such has been the case, for instance, with my sacred tattoos. But it’s also been with things like my hair, my clothing, adornments, and even my body or face morphing. A lot of this is that I tend to feel “not myself” if the outer doesn’t match the inner or where I’m headed and some of it is as a direct result of needing to express my personality, unique creative self expression, and way in which feels most aligned with the “real” me. Some simply happens naturally and some with intention to match the natural. So, as mentioned, with so many shifts lately for me in very dramatic ways, I’ve seen this naturally express itself with how I look and my desires to share how I feel. And of course the way I dress has gone, and continues to go, through constant transformation, which is why I move out clothes often and bring in new that are more reflective and help me feel like “me” just as my tattoos help me to feel more at home in my own skin. I immediately can feel “off” if my hair or clothing is not matching the vibe of how I’m feeling and what I’m creating in my life currently – literally, making me feel quite energetically icky and out of place. And over this last year that has taken a huge turn, as mentioned already in my hair taking its natural, ancient and cosmic “roots”, and just this Saturday while visiting and taking my parents out to celebrate my mom’s upcoming 74th birthday tomorrow, I knew I needed to have my hair freshened and purged. My mom used to be a beautician (what her family did back in France), so she’s done my hair a lot over time and Saturday we chopped off four inches to my very long hair. This felt necessary, as the ends are literally and symbolically the oldest parts and carry the energy of the past…so it felt important to literally shed it, just like my dreams of snake skins recently, and how I regularly enjoy body scrubs to slough off old skin too. Being that my hair had grown so long, it still remains so, but it was amazing once again to see and feel how that made a difference even without getting a whole new hairstyle – yet. 😉 I not only looked different, but felt completely lightened and new and it even activated the next phase of change upcoming with more hair shifts to match dreams and visions I’ve been having of my origins. But on top of this, I’ve purged, minimized further, and refreshed my wardrobe as well, and all of this has really become outwardly a reflection of the magickal parts of life and my wanting daily to, in all ways, live fully as all that I love and really am, and will keep me clearly focused on the path ahead in the most embodied and aligned way. This has seemed to morph me literally into my Faery Bunny self, with hints of cosmic, ancient, and water nymph/mer qualities. So while people may have felt this about me, it really isn’t something one would have to “feel into” anymore, as it’s becoming quite literal. I feel and see this to be happening more and more with many people, as things shift and we’re lighting up those latent parts of our DNA, stepping up and out, and integrating more of our Cosmic and Earthly selves, we are seeing this in how we find ourselves walking in our human bodies as more of the otherworldy beings we have retrieved and remembered, through physical form here. Exciting times and feels so much more natural. So while most people know I’m a rabbit lover or perhaps a crazy rabbit lady 😉 some may not know how far that extends, but truly my life is immersed in Faery bunny energy through and through. These are just some photos of the magickal bunny wardrobe I have and wear below. Photos include: 3 sparkly vegan rabbit shoes (I normally only wear flats, but bunnies have me reaching to new heights again these days when I feel so called), matching vegan rabbit purse, a one-of-a-kind amethyst carved rabbit ring, a purple satin skater dress with dancing bunnies, an aqua poodle skirt with bunny border, and my Peter Rabbit collection of vintage 60’s dress, wedge heels, vintage Beatrix Potter original sweater, and my Peter Rabbit statue from Laura. Laura has even said I’ve literally turned into a Faery bunny, like this photo that briefly captured this in me seeping through in one of my shape shifting moments a couple of years ago and now seems to be the pervading emanation these days, although has integrated with the other elements I shared above, too. I’m curious to see how this will evolve and morph in the days and months ahead. But what you don’t see pictured here is that my wardrobe and sacred space also include a vintage rabbit cardigan, 4 rabbit t-shirts, 3 rabbit tank tops, 3 rabbit leggings, 1 rabbit sweatshirt, several rabbit pendants and rings, 1 rabbit scarf, rabbit flannel jammies, rabbit artwork, a stuffed rabbit I sleep with (the surrogate bunny to my little ones that they enchanted), a rabbit support pillow, crystal rabbits, and other rabbit pieces for my sacred space. And the rest of my wardrobe contains various other elements of “me” and anything that doesn’t I either have, or will continue to weed out. I’ve fully cracked open the Cosmic egg and all the “me” is oozing out for sure without worrying what others may think. Just simply about living a life of passionate purpose by looking within and seeing what truly moves me and melting into that love. It reiterated to me, that when we embrace what truly brings us the greatest joy, express that in any and all forms, and understand how we can utilize all aspects of life and the material in creative, healthy, and valuable ways, we also bring that same energy to others to experience through our expressions and to mirror the relative possibilities within each other to do more of what supports this too in life. So while I could just feel and emanate my essence energetically, I’ve been guided to literally take this through to all levels of experience, to include the physical as an expression of consistency and action in a holistic way and through every avenue of my existence here. Having peeled back the layers I find clarity in my divine desires and that all things I’m about are truly encapsulated in the focus of what inspires me most. Channeling this into soul fulfillment, dream manifestation, and the reality of my choosing is the gift of letting this desire move through me and that includes moving through me in any and all ways – sharing and expressing my deepest divine desires and beingness. I believe that living our authenticity in any and all ways that feels truest to ourselves and expresses our passions is effective use of creative power and supportive of personal empowerment and frequency, joyous living, and inspirational motivation that aligns and supports us with our intents, while igniting similar fires within others. Plus, it simply brings a little sparkle of joy to the day, some giggles, and smiles…and if nothing else, that’s worth a lot! Just beautiful…gave me chills when I read this earlier this morning, calling up many connections for myself, which took time for me to reblog until I’d processed on my own. The message of light and hope goes along with the dreams I’ve recently shared embodying the same theme. 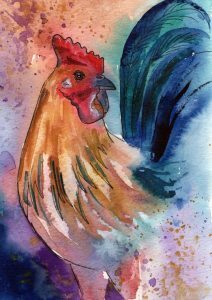 Thank you Dana for bringing to “light” the essence of this Year of the Rooster. Last night I had an interesting dream of meeting Neptune – God of the Sea. Not surprising, since I’ve been so immersed in the depths of water energy recently with all of our oceanside RV sites we’ve been stationed at, along with the abundance of rain and sea life to accompany it. Seemed this was foreshadowed also when the RV next to us pulled out while in Avila Beach and I caught its name in the side window – Neptune. The dream took place after I’d woken in the night, hearing a downpour of rain outside and sea lions barking in the marina. In my dream I was staying at a very large, sprawling hotel by the ocean. I originally was in one room, but for some reason they wanted me to move rooms and they provided me two new keys. I agree with Linda of Litebeing Chronicles that this Energy Update from Lee Harris expresses important key dynamics and perspectives for personal and collective understanding and change in these now times. Finding YOUR balance is key, regardless of the imbalances experienced abound. As Lee shares, nothing can be guaranteed in terms of outcome in any way, but you CAN shift your own experience of things with your own relative and conscious actions. And like many of us have been sharing, you CAN create your own reality. Perhaps, as Lee shares, it’s time to invite yourself into your OWN NEW PARADIGM. I only ever share that which feels resonant and in consistent alignment with my own perspectives. Maybe this will have resonance for you. Dream posts continue, as this was another meaningful dream I felt compelled to share now that I’ve had time with it for myself. The day after my dream I posted yesterday about the two blue snakes and gila monster, as you might recall was the day “The Tree Beckoned and I Followed.” Well, after that experience in finding the presence of orbs all around me inside the tree portal (appearing like I’d stepped inside the Cosmos) that night I had another potent and healing dream that brought full circle a gift from my beloved rabbit, Joy, who has also been showing up so profoundly lately. Synchronously, this was also the night of the marches collectively taking place. Since many of you so sweetly sent messages and love about Joy when she transitioned and have followed along with my bunny love’s journeys, I thought this might be not only conclusive as a companion piece to my share about Joy’s last moments and days on Earth in the physical I wrote and spoke about extensively in this post “In Life & Death, “Joy” Is Always There,” but may also be supportive to others who have experienced loss of their beloved animal companions and loved ones in demonstrating the eternal connection that does not end and how we are continually being supported by the connection shared. In my dream on Saturday 1/21, Joy was with me and she had taken ill, just like in the end before she left in waking life. The odd thing was that her tail came off in the dream and it was very large – much larger than normal size. It literally broke off on its own, but perfectly. I could see all of the tiny bones and ligaments that connect it to her bum, but where it broke off was so clean and precise, without blood or any signs of injury. This indicates to me a sense of no suffering being experienced on her “end” and a clean “ending” and healing closure at the “tail end” of this experience. The tail being so large and furry feels to be definitive in this closure and the “end of an era” again reiterated for me, balance being restored, and that I’m using intuition, creativity, and wisdom in my life more than ever and this will be increasing. Although rabbit’s feet are connected to “lucky charms,” the tail may also be considered as such since there is connection with rabbit’s tails as their way of escaping predators with the white flash of the tail confusing them as to their exact location when in pursuit. I also feel this symbolism she showed me is directly connected to my book, but that’s for me to understand the connection, although I will say that direct healing is involved on many levels with its unfolding. But back to the dream…. I then notice her feet, especially the left one, and they look exactly like Fiver’s – the mouse that I nurtured recently. These mouse feet were only on her back legs, just like Fiver’s back legs were the only part of him that showed signs of his injury from the impact to that area and lower back. That left leg on her was completely limp, red, bruised. I remember one spot on Fiver’s leg had a bruised, red area, so again tied in with him. Then in the dream she comes and lays on me, as I comfort her and caress her. In the dream I start calling around to vets to get her in (just as I did in waking life when she took ill), but I get the sense she won’t make it in time to get there. In real life, she had just made it to the ER after a long over an hour’s drive and then passed not long after I left her in the doctor’s care to monitor over night, at her request. So, now in the dream I am aware she won’t make it and I will just be with her to help her transition peacefully, just like I was there for Fiver. She is in my arms and then suddenly she lets out a little cry, followed by one last big breath and I know she is leaving her body with that. Nestor had let out a piercing, excruciating cry when she left this Earth, but this was different….it was soft and although rabbit’s only cry when in pain, it was an indication of release rather than suffering to me and not as tormenting to experience as Nestor’s was. I then rub her head softly, as she lays in my arms and tell her over and over that I love her, wanting that to be the last thing she hears before she completely goes and slowly her heart and breathing wind down to nothing. I’m sobbing in the dream and at this point can feel my half wake state in real life and know and can hear me wimpering in real life too. Although emotional, it was a gentle experience and was not at all a dream, but completely a reality she and I were sharing for a purpose and rewriting the end together. I felt that she was connecting me to understand a deeper healing than I may have been aware of that I had through Fiver. Perhaps wanting me to know she had projected a part of herself in Fiver when he had come to me, or that he had been sent to me by her, as a way for me to experience this healing with him through her. This may include being there with her at the very end when she transitioned, since I was not when she passed, as I had left her at the ER by her choice in not wanting me to have to go through that experience. Although I knew she wanted that and maybe thought I was not ready yet for this, I felt like I wished I’d been there. Maybe her seeing how I handled Cosmo’ passing, made her now know I was ready and she gifted me this experience in “dream” time and with Fiver, so I could relive being there with her. And she gifted it in a gentle, beautiful way. Even the way that Fiver jumped on the crystal when he transitioned, like blasting off into the Cosmos, could have been a sign of connection with her since Joy was so connected to crystals herself and always layed with them and had their points jutting into her body to receive their energy, working with gridding our homes and journeying with them. This dream, as they all are to me, was very “real time”. And I did feel this sense of deepening closure and peace knowing I supported her this way and that I was strong enough now to keep going through these kinds of experiences in supporting these sweet souls in their transitions. So connecting with Fiver is not far from reach for her either. 😉 And creating timeline jumps for us to relive/recreate what “is” would be right up her alley too. I love how she changed the “ending” and that I could be with her. Quick side note and speaking of Nestor, the day after that dream we headed down the stairs from our place and the crew was there shoveling the snow as they do and one guy says to the other to alert him we were coming up behind him since he was busy shoveling and didn’t see us, “Watch out Nestor.” I smiled so big knowing my sweet Nestor was wanting to chime in too with reiteration to the dream connections. And to add to the timings and synchronicity, another tie-in with Joy took place just a couple of days before my dream of her. I received a voicemail message from the doctor in Jackson, Wyoming who did her surgery. The story line of this is included in the above post on her transition. He was such an angel, who came in on his day off to do this, talked to me on the phone, provided me his personal number and went above and beyond in helping her/me. A little rewind…..about a month or a few weeks after Joy passed I’d sent him a plant with a nice thank you note just wanting to acknowledge how grateful I was for everything that he’d done for us. He even called me the night she transitioned after talking with the ER doctor that night (late I might add) to give her background right before she passed. I actually never heard from him after I sent the thank you gift, so I wasn’t sure if he got it, but figured that our crossing of paths was complete. Then 6 months later he calls and in his message says he just wanted to say hello, was thinking of me, thanked me for the nice plant and thoughtful card…and told me whenever I had time to give him a call to talk because he had felt such a good vibe from me and really connected with me, so he wanted to see how I was. I was so touched and it felt like Joy’s way of starting to get the ball rolling with her plan of recreating the “end”. And then back to the day at the tree portal, right before that night’s dream, I now was able to connect the dots and that this portal was activating the opening to this experience Joy was setting up for me to rewrite “history” and I feel that larger orb above me was her. What an experience and how gracious and loving Joy is to gift me this one thing I had wished. There are no limitations to our connections, eternal love and bonds, and what is possible. I feel a greater lightness and deepening of my love with her and my loves, and gratitude for her gifts in knowing what would be perfect for my journey and moving forward with my work. Dream time has been SUPER active and potent in conscious awareness again, after a short lull of things not needing to come to awareness in waking life about them and not remembering them upon waking in the morning like I normally do, even if I had during the night if I awoke. This to include another surge of dreaming about so many people I know, whether met in person or not. Collective stuff is swirling hugely with major transformation happening for all. Yet this last Friday, 1/20, I had quite a potent dream again with snake at the forefront, which felt both personal and collective since it happened to be on the night of the inauguration and before the next day of marches across the states. I’ve been experiencing myself more and more as a transmitter, so to speak, but now taking place in a more empowered and conscious way than it used to be the first part of my life. In this way, it does not affect or trigger me, but I remain a detached observer and channel transmuting energies. It’s all very fascinating, more so because I am aware of the evolution of this and it not tormenting me or confusing me as it did when I didn’t have my Pisces fish in balanced grasp. That tug of two fish swimming in opposite directions can be challenging, but also provides the path to a Middle Way. Anyway, Friday night’s dream was fascinating to me as well. I hadn’t had time to share more in depth about it until now. I have dreamed of snakes often and shared of them before like in this post: A Little Full Moon Snake Dream Activation, but this one was very different again and involved blue snakes and two dreams converging. The first dream found me in bed and finding a snake skin at the end by my feet in the covers on top of the bed. I knew where there’s a skin there must be a snake and so I searched the room to find the snake. The room itself was unique as it was both indoors and outdoors with a floor of grasses, bushes and rock where there would otherwise be flooring or carpet. I found the snake in the bordering tall grasses of the perimeter of the room and it was beautiful. It was a lighter to medium blue color with medium to darker blue marking and smaller in size. The first thing that came to me was “blue cornflower snake,” which I remembered upon waking. Then my dad shows up and it was unlike him to approach a snake, although would think it beautiful, and may have connotations about it. But my dad behaves differently and magickally. He goes closer and very intentionally towards it putting his hand out even closer, less than a foot away. I tell him to be careful because it is a very poisonous snake, but he edges closer with his hand with peace and centeredness and the snake for a moment slowly pulls his neck back as if to strike, but instead does not. He gently leans in closer, as if mesmerized and in communion with my dad and his hand. They are in perfect harmony and as if my dad has charmed the snake with his balanced energy. I then wake up and tell myself to remember this dream and the name of the snake that came to me, as I didn’t feel like getting up and writing anything down. I then go back to sleep and the dream continues. I don’t ever remember this happening even if I want it to, or at least not that I consciously remember. The dream continues with the memories I intended but shifts into a new version of the dream as an add-on. Again, I find another skin and go searching for the snake that shed it. But before finding the snake a blue gila monster walks across the center of the room and through the grasses with slow deliberate steps. I am only needing to see it and then my attention goes back to finding the snake I’m aware of being there. This time I find it under the corner of the bed where the mattress is caving down inside the bed frame revealing it below. It is again a beautiful blue snake, much like the other, but much larger…like a boa. I stand straddling the corner of the bed and this area that is open revealing the snake below, but I start to sink lower and lower, caving in toward the snake and he pulls back again like the other, but does not strike. He is inches from my ankles and feet, but again we seem to be in harmony together. (Ankles are connected to Aquarian energy and feet to Piscean energy….both very strong for me in my astrological chart). This is all I remember, but seemed like I got all of the important parts to bring back into waking life for sure to this layered and potently symbolic dream. When I woke I started researching blue snakes….there are quite a few – Blue Racer Snakes, Blue Coral Snakes, Eastern Hognose Snake, and yes, even Blue Corn Snakes….and more. No blue cornflower snakes, at least that I could find, but either that was how I interpreted it, or it was because the “cornflower” part was significant to remember too for symbolism sake. There is so much one could interpret from this dream, especially given symbolism of everything, and I won’t go into all of the possibilities or full personal interpretation I have been piecing together, but will bring to light a few things, as I always find it helpful to share how we can figure out the meaning for ourselves of things by looking into our lives with honesty, doing a little bit of online researching on our own, looking at what’s going on in and around us, the collective field of experience, etc. The first smaller snake I find to represent my inner child, on a personal level…and the little girl me. The communion in harmony with my dad felt like a new layer to our relationship has been activated and my making peace and harmony with the old male that is now in process of transforming. That I’m taking back my power in terms of the male and the father role in my life and equality is taking place here, not to mention I am now bringing forth a new empowered and balanced male through my life that the snake skin shares I have shed. The larger, boa-like snake, being the new me and transforming my Pisces and Aquarian aspects of myself – I have Sun and Mercury in Pisces, as well as Jupiter and Venus in Aquarius. It also speaks to me about my dad going through his own personal transformations with himself in relation to this and coming more into balance with his divine feminine parts. And then I see a collective symbolism of the shifts taking place and the potentials for us all where the male and female energies are finding their way slowly to greater balance through all of these turbulent and transformational times that are shaking up things and creating opportunity for us on a bigger level even though temporarily seem like something completely different. The latter due to the tie-in with the inauguration that calls to mind these specifics people have been warring over and having great torment about emotionally, which is bringing rise to new perspectives and more unified ways of seeing things through greater compassion to understand one other…or at least that’s the opportunity. My dream presented a hopeful outcome. And hope is present with the reference to the cornflower, although this is a flower that carries very dramatic and mixed symbolism over time…this is the one thing that stands out to me the most in all that I researched. There are references to its fragility, but being quite a courageously determined plant that can withstand harsh elements and still thrive where other plants cannot. It can be traced back to ancient times and old traditions, including Ancient Egypt where it was connected to life and fertility, reanimation and resurrection. All parts of the plant have been used medicinally and according to Greek mythology when Achilles was wounded by a poisoned arrow, the wound was healed by applying cornflower plants. Interestingly that poison in the arrow was said to come from Hydra, usually depicted as a huge poisonous water snake, but interpreted as a giant slug. In Christianity, slugs were associated with the devil, just as snakes have been, and the cornflower remedy became a symbol of Mary and Christ, often found in Christian fresco depictions. And there’s the energy of tenderness, reliability, fidelity, and power, sovereignty, and majesty throughout time that came to be linked with cornflower as well. And the Freedom Party whose color is blue, wears cornflowers. Brings light to my thoughts on a collective transformation in process with these paradoxes of meaning. But still I focus on “hope” in light of it all, and potential that could unfold with our conscious efforts. Blue is a color of peace, calm, trust, communication…it is also the color of water and sky – water and air elements – and of the throat and third eye chakras…in this case more emphasis on the throat by the color I saw in my dream, but connecting with the third eye with the darker blue markings. This bringing focus on a new level of inspired and intuitive self expression, communication, song and sound…all things feeling relevant for me and my focuses, but also in the greater landscape. Air and water elements are bringing mind and heart together in balance as well, male and female governed energies, and a greater fluidity and ease of flow with change, abundance, and expansion. There is an element of healing help the snake’s presence brings to the primal parts within us….our origins. There was nothing negatively felt in the dream, nor any pervading fear, although I’d stated caution to my dad when he went close, but I did not overreact or try to intervene or panic. It was from a place of knowing this was out of character for him and that I didn’t know if he knew how to handle the situation, and yet he did. I have long through my life worked on healing my throat chakra, empowering my voice, and speaking up for myself and voicing my uniqueness…not being afraid to express who I am, share my ideas and beliefs, despite anyone including my family or dad potentially thinking certain things of me. After all, he is a Virgo, my opposite, and my role has been to temper these opposites within myself, while remaining authentic to me rather than follow in his footsteps. And yet, he had many positive things to teach and help me to integrate into my own version of new male energy…something by my own example directly relates to his own journey too. It also speaks to how sound has become a pervading element to my life through both my voice, song, sound channeling, singing bowls, and frequencies (recently gifting myself for my birthday two quartz crystal singing bowls that I knew I had to have that are a binaural beat theta wave pair – talk about potent balancing and invoking conscious dream, receptivity and opening a gateway to all things watery). Snakes are particularly connected to this as well, not just the blue color that showed up connecting to the throat and ear and telepathy….they don’t have eardrums or external ears or openings like we do, but do have tiny bones in their head that conduct sound and allow them to hear low frequency sounds and sense vibrations traveling through Earth. The blue gila monster also felt very potent to show up (it is one of two truly venomous lizards), as I had never had this before and didn’t know of its energy other than its transformative reptilian connections of essence I’m aware of. In looking more into gila monster it supported these things as I learned it teaches us to stand strong in what we believe and to protect that which is ours. It also teaches of the rhythm of life and maintaining balance and flow, but keeping determined and quiet about things in your journey while in process, preserving your energy, not overextending (gila monsters spend up to 95% of time undergroound and can go without eating for a year), are about survival, strength, and healing and connected with masculine energy. And of course snakes are hugely transformative and healing in their wisdom, awakening creative forces, intuition, perception, and life force. Connected with the Sun and golden light, there is great alchemy with snakes that brings vitality and renewal to our understanding of our wholeness. One of my spirit guides is Rainbow Serpent Teacher, which is why snake is always around and I wear a snake upon my right hand and wrist as a sacred tattoo and had a ring made as a serpent with a reminder mantra from this guide of my engraved inside of it. There is a link to the Great Mystery, cosmic consciousness, and shamanism with snake energy – again very active and showing up in greater ways for me, personally, right now, including my creation of the pieces I’m told to make including wands, scepter, and staves channeling through. But this is happening on a grander, collective scale where things are all coming to the surface for us to integrate and no longer suppress or deny. The snake guides us and acts as guardian to those that embrace its energy, helping us to travel to sacred places and retrieve parts of ourselves on a cellular level and the hidden knowledge that lies within. The skins of course are about shedding as a ritual to rebirthing and spiraling into new levels of awareness and being. A potent dream for sure and perhaps it “sheds” some light on something within your own experience, or inspires some extra hope within the chaos to help keep you grounded and centered.